Young Aston Villa midfielder Barry Bannan has said England international Gareth Barry has been an inspiration. Bannan, 18, who won BBC WM's Young Player of the Month for October, said first-team stars, like Barry, are always happy to offer advice. "Gareth's the obvious one, he's just brilliant and you look up to players like that," Bannan said. "He'd never tell you to go away, he'll speak to you, he'll listen to you and give you good advice." Bannan scored both goals in Villa's 2-1 reserve-team victory over West Brom on Monday. And after a prolific 21-goal haul for the reserves last season, the diminutive midfielder is now looking to follow the likes of home-grown talents Gabriel Agbonlahor, Craig Gardner and Nathan Delfouneso into Martin O'Neill's first-team squad. "I'm just waiting for the chance to come, and if it comes I'm just looking to grab it with both hands," Bannan told BBC WM. "I'm going to keep on working hard and keep proving to the manager that I'm ready. "I'm sure that when I'm ready he'll tell me and let me have a go." 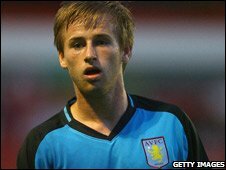 Bannan is the first Villa player to win the BBC WM award twice, the club's other previous winners are Zoltan Stieber and Stephen O'Halloran.